We are a small family run business designing and handcrafting leather ‘Nelson Were’ bags and accessories. We’re dedicated to giving you the very best products, with a focus on design, quality materials and good customer service. Nelson Were is a Kenyan born designer who is the creative force behind the brand. He first developed an interest in fashion whilst living in Kenya. He started out making his own clothes, and then followed with designing and making shoes and jewellery to sell. When Nelson moved to England with his wife Jenny and child he enrolled at University for the Creative Arts (UCA) on a Fashion Design Degree. Two more children later, he is a UCA Fashion Design Honours Graduate whose catwalk collection debuted at London Graduate Fashion Week 2014 and is now building his own business and brand. We have a studio and shop at the Quex Craft Village, in Birchington, Kent. 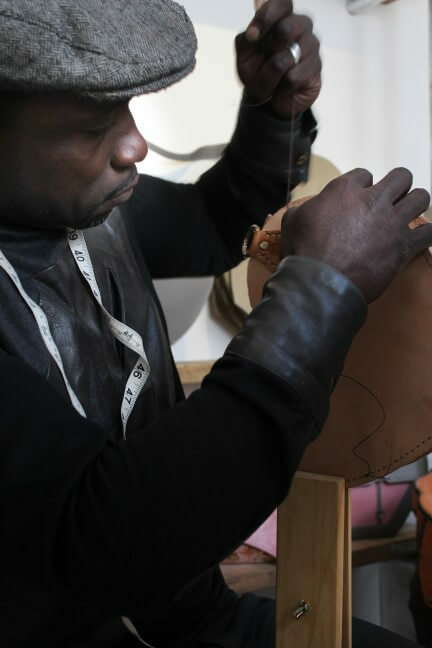 The studio is where Nelson designs and makes his own handbags and accessories; all with his own unique style. All Nelson Were products carry the striking logo and many can be personalised as all items are handmade on site. Visitors to the Quex Craft Village are able to see Nelson at work in his studio; where we welcome the opportunity to talk to customers about his designs. We take commissions for a bespoke design service for our clients. All existing designs can be made in different colours or materials upon request or we can make completely new designs to suit you. As a compliment to our cherished customers, our new designs are named after the first person to commission or purchase them.